Firm of photographers with studios in London and Eastbourne. George Lavis was born in about 1831 in Bristol and was the son of John Lavis, a "land steward". He married Rebecca Finlayson at the late Countess of Huntingdon's Chapel in North Street, Brighton on September 9, 1857. Rebecca had been born in about 1828 at Reading and was the daughter of Thomas Finlayson (1795-1851), an architect, and Rebecca Burton (1792-1865). According to the marriage certificate, George Lavis was an artist (possibly a photographic artist), and he and Rebecca were in residence at the Chain Pier. When the 1861 census was held, the couple had moved to 10 Camden Grove in Camberwell. George is listed in the census as a photographer and Rebecca as an "artist", which in this case almost certainly meant photographic artist. Soon afterwards, George and Rebecca opened a portrait studio at 135 Regent Street in London, which quickly attracted a wealthy clientele. They decided to try to repeat their success in Eastbourne, and in about 1866 acquired the existing studio of Henry Niblett at 42 Terminus Place (the studio is listed under the name G & R Lavis in Kelly's 1867 Post Office Directory of Essex, Herts, Middlesex, Kent, Surrey and Sussex). Within about a year they moved the studio from Terminus Place to 71 and 73 Terminus Road. When the 1871 census was held, George and Rebecca Lavis were visiting Hugh Snelling in Brighton, who ran a bazaar at the Chain Pier. George is described as a "master photographer", employing "three men and three women". It is unclear whether one of the women was Rebecca, who is described as an "artist in photography". George Lavis died of heart disease and rheumatic fever at 71 Terminus Road, Eastbourne on September 21, 1875, aged only 44. Presumably, he was visiting the Lavis Studio. His sister, Harriet Snelling, of south Hackney, was present when he died and registered his death. The widowed Rebecca may have continued to work as a photographer for a few more years, before retiring. She outlived George by many years and died in about 1900. Although the Eastbourne studio continued to trade under the name "G & R Lavis" after George's death, it actually operated under the proprietorship of Thomas Brankridge Rowe. Rowe was a skilled photographer, whose cabinet prints and cartes de visite were greatly admired, and he quickly built up a large following amongst the more fashionable Eastbourne residents. Rowe was born on August 26, 1848 at his parent's home at 36 John Street in Marylebone in London. His mother was Eliza Rowe, formerly Doyle, and his father was Thomas D. Rowe, a merchant druggist or chemist. The 1861 census records that he had three younger brothers: Francis, Arthur and Ridley. By this date he and his family were living in Clifton Road (East) in Marylebone. When the 1871 census was taken, Rowe was living at 71 Terminus Road in Eastbourne, presumably in rooms above the Lavis Studio. Sharing the premises were Margaret Wood, who worked as a bookkeeper, and Sarah Frost, a servant. The census confirms that Rowe was a photographer. On January 16, 1874, he married Catherine Mary Stretch at St Michael's Church in the Hanover Square area of London. Catherine was the daughter of William Stretch, a "gentleman" and had been living at 23 Burton Street. One wonders whether she had been a childhood friend. Rowe gave his address as 9 Victoria Place in Eastbourne, which connects Terminus Road with Grand Parade. Thomas and Catherine's daughter, Maud Catherine Susan Rowe, was born at 16 West Terrace in Eastbourne on December 4, 1874; their son, Thomas D. Rowe, followed about three years later. In 1911 when the census was held, Maud was unmarried and helping her father with his photography. Maud and her parents were living over the studio at 71 & 73 Terminus Road. Thomas D. Rowe had left home. Rowe was still in charge of the Terminus Road studio in 1912, and it is unclear just when he retired. He died at Eastbourne aged 76 in late 1924. The firm of "G & R. Lavis" was still trading at 71 Terminus Road when Kelly's 1924 Sussex Directory was compiled, but by 1927 it had moved to 129 Terminus Road, where it remained until 1940 or later. After Rowe's death it must have had a new proprietor though who this was remains to be determined. After the war the shop became a drapery. Although Rowe specialised in portrait photography, he also undertook outside work, and published stereoscopic views, for example of Beachy Head. At a later date he reproduced some of his landscape photographs (of Eastbourne, Willingdon and Wilmington) as real photographic (or in a few cases collotype) postcards. The black and white real photographic chosen for the titlepiece has no caption, but is blind stamped "G & R Lavis. Eastbourne". It is believed to show the medieval St Mary's Church in the Old Town, but the viewpoint, although striking, is decidedly unusual. Nearly all views of this church sold by other publishers are taken from an eastern vantage point and show the tower in the distance, not the foreground. Cards issued from about 1905 to 1925 show no trees west of the tower, which suggests that Rowe re-used an earlier photograph, overlooking the fact that the trees had been felled. 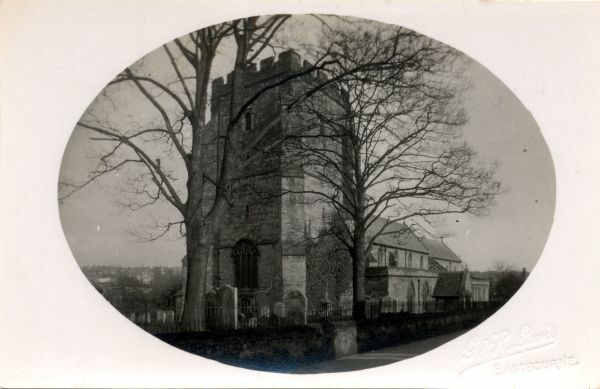 The St Mary's photograph is oval shaped, but the majority of G & R Lavis cards have rectangular sepia-toned photographs, either with white borders and printed captions or lacking borders and captions. Many of the borderless cards are blind stamped "G & R Lavis, Eastbourne", but others are not, though all that have been found to date have divided backs of identical design and a distinctive matt finish. Many of the men shown walking the streets in the borderless cards wear top hats, which suggests the photographs were taken well before 1900. Several cards show St Saviour's Church with its spire, which was completed in 1872. One card of the seafront (see Gallery) must date from the 1870s as it shows vacant land now occupied by the Queen's Hotel, which opened in June 1880. Two others show Eastbourne Pier before and after it was damaged by a storm in 1877. No Lavis card has been found that has a postmark, but all the cards seen have divided backs and therefore cannot have been issued before 1902. In the early 1870s a mystery photographer took photographs of Eastbourne, including a set of panoramas from the newly constructed spire of St Saviour's Church in South Street. Fred Cooper of Eastbourne later published the pictures as so-called "sixties" views in his "Old Eastbourne Series" of postcards. Cooper, who was not born until the late 1870s, cannot have been the photographer. Presumably, he purchased the negatives from some long-established photographer, who just possibly might have been Thomas Brankridge Rowe, or even George Lavis himself. Acknowledgement: Grateful thanks are extended to Mike Green (Barcombe) for searching out examples of Lavis cards, few of which seem to survive.